Few vehicles are as legendary as the Ford Mustang. And after its total redesign last year, the 2019 Mustang returns with a new infotainment system, additional option packages, and the same great attitude it’s always had. Regardless of if you prefer the sleek lines of the coupe of the open-air experience of the convertible, few other cars in all of Humboldt, Bruno, Prud’ Homme, Sagehill, Saint Benedict, Middle Lake, Pilger, Fulda, Marysburg, Muenster, Saint Gregor, LeRoy, Englefeld, or Lake Lenore Saskatchewan will put you in touch with the road like the Mustang does. And with a trio of potent engines available, there’s also few other cars that can excite like the Mustang does. Interested in taking a test drive in one of these amazing machines? 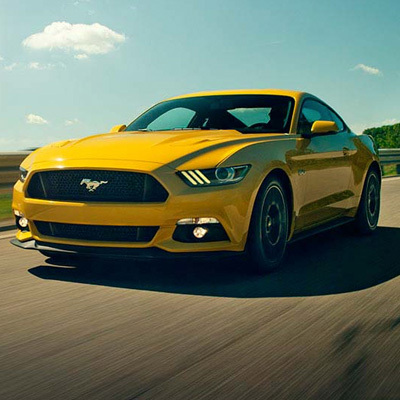 Explore our New Vehicle Inventory to see what Mustangs we have available. All of these engines are also available with your choice of a paddle-shifted six-speed automatic or six- speed manual for precise control over what’s lurking underneath the hood. Step inside the 2019 Mustang to find a lavishly equipped cabin that’s a far cry from the austere interiors of old. Dual-zone climate control, heated and ventilated seats, an 8-inch touchscreen with Ford’s latest Sync 3 infotainment system, selectable driving modes, and much more are all waiting inside. The result is a powerful road car that can thrill you on a back road, while comforting you during your daily commute. You’ll never mistake this car for anything but a Mustang. With its chiseled flanks, deep front splitter, and bulging hood – the 2019 Mustang resonates with performance intent from every angle. An optional black-painted roof (coupe only) adds a further air of motorsport, while secondary turn signals integrated into the hood vents harken back to Mustangs of yore. While normally not the first priority of muscle cars, in a car this fast it’s nice to know you have some serious driver aids to back you up. Powerful Brembo brakes, adaptive cruise control, blind-spot monitoring systems, forward collision warning, and a rearview camera all help you keep the Mustang’s gorgeous bodywork in one piece.